It is such a beautiful day today and the sun is shining. That meant flowers to me. And, at Splitcoaststampers the Colour Challenge inspired me, asking us to use Turquoise, Orange and White and for dessert, a touch of Metallic. I used the turquoise in my background and the orange in my flowers and the metallic in my sentiment, plus there is a metallic sequin. It was such a nice change to play with some flower dies. Hope you like it too and thanks for having a peek today. 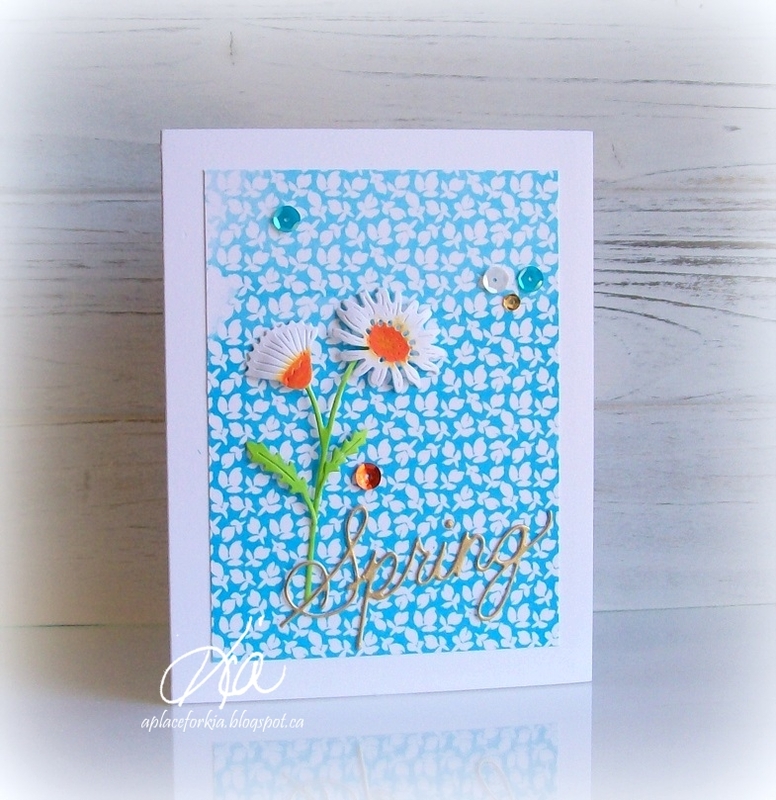 Products: Frantic Stamper Mix 'n Match Wildflowers, Frantic Stamper Spring Sentiment, Sequins, Spectrum Noir Markers, Gold Leafing Pen. Products: Simons Says Stamp Stepping Stones, Spring Flowers and Wishing Sentiment; Tim Holtz Distress Inks Spiced Marmelade, Picked Raspberry, Mustard Seed, Peacock Feathers, Tumbled Glass and Mowed Lawn. A birthday card I did for BRAK, the group I belong to at Splitcoaststampers where members send Birthday cards to other members as a random act of kindness, hence BRAK. 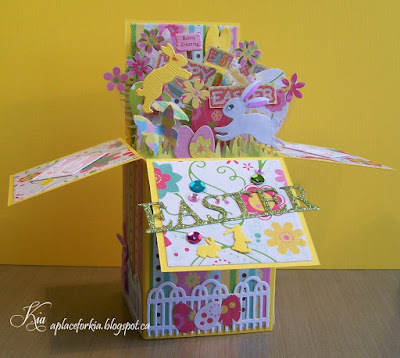 I do not upload these kind of cards in my gallery there, only on my blog. 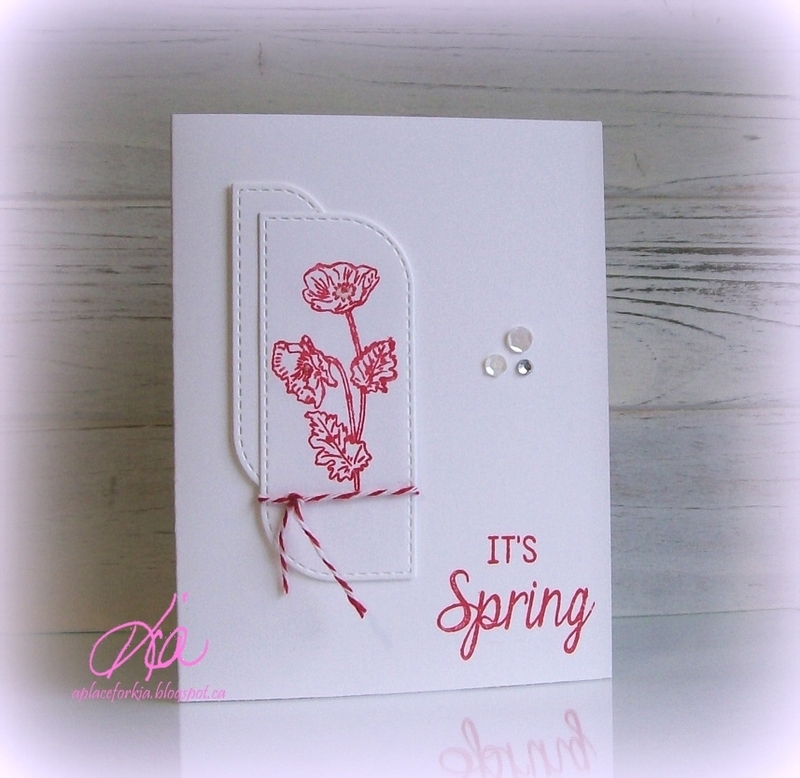 For this card I used Simon Says Stamp Spring Flowers. I heat embossed with white embossing powder and coloured with Tim Holtz Inks and fussy cut the leaves and flowers to arrange. 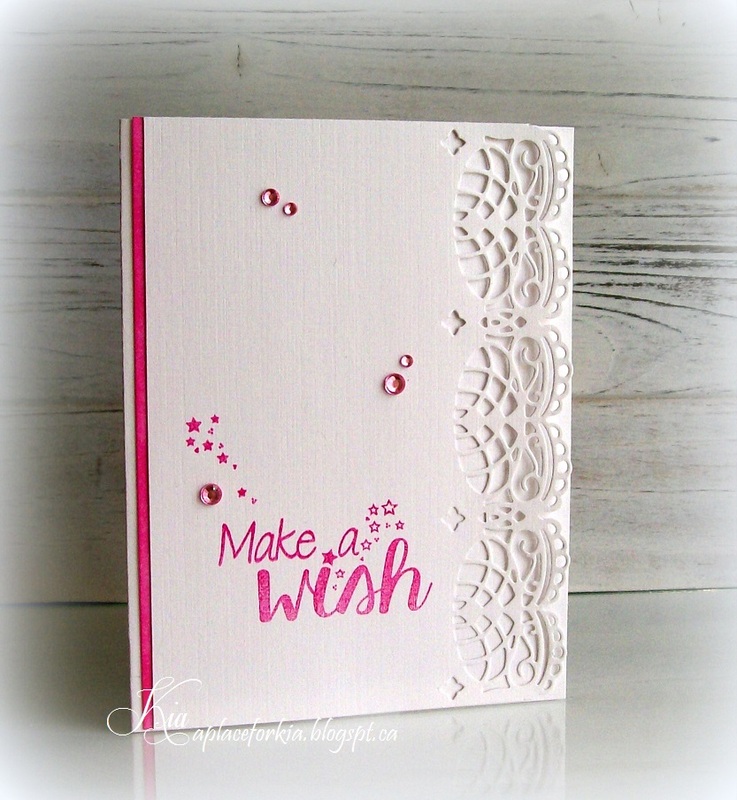 A few sequins and crystals and my sentiment from Frantic Stamper Celebrations set finishes my card. I hope the recipient liked it. Thanks for having a look. 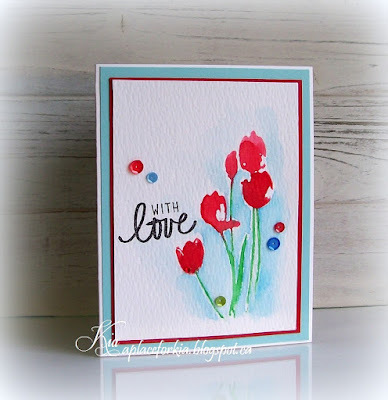 This card I did for the Inspiration Challenge at Splitcoaststampers. I was not in the mood for doing much, so I embossed some watercolor paper with Ecstasy Crafts Rose Embossing Folder and spritzed my paper with water. I dropped the ink, adding more where I wanted a deeper colour. Then, before it was dry I embossed again to get that deep embossing. Added the sentiment, sequins and crystals to finish. Thanks for having a look. 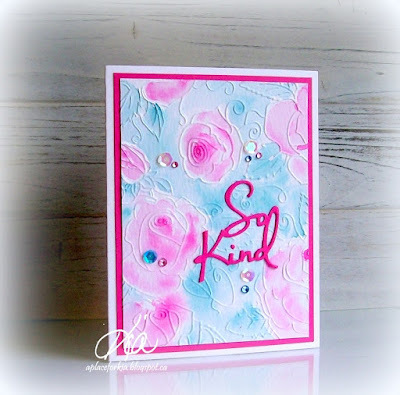 Products: Ecstasy Crafts Rose Embossing Folder, Cuttlebug With Gratitude Sentiment, Tim Holtz Distress Inks Picked Raspberry and Broken China, Sequins, Crystals. A card I did for my lovely friend Faith who has lost her Mom, which is clearly a difficult time for her. You might ask, why would you have crystals on your card? I did that for her Mom, who was a crafter, and who also taught me cross-stitch. 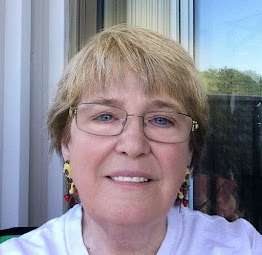 She was a very kind lady, with a wonderful sense of fun and patience like no other. Mrs. Lumley would appreciate the crystals, and this card. She will be greatly missed by all who were fortunate enough to have met her. I am a member of BRAK, Birthday Random Act of Kindness over at Splitcoaststampers, and this is a card I sent to a member for her birthday, which is today. I wanted to be sure she had it before I posted it here on my blog. 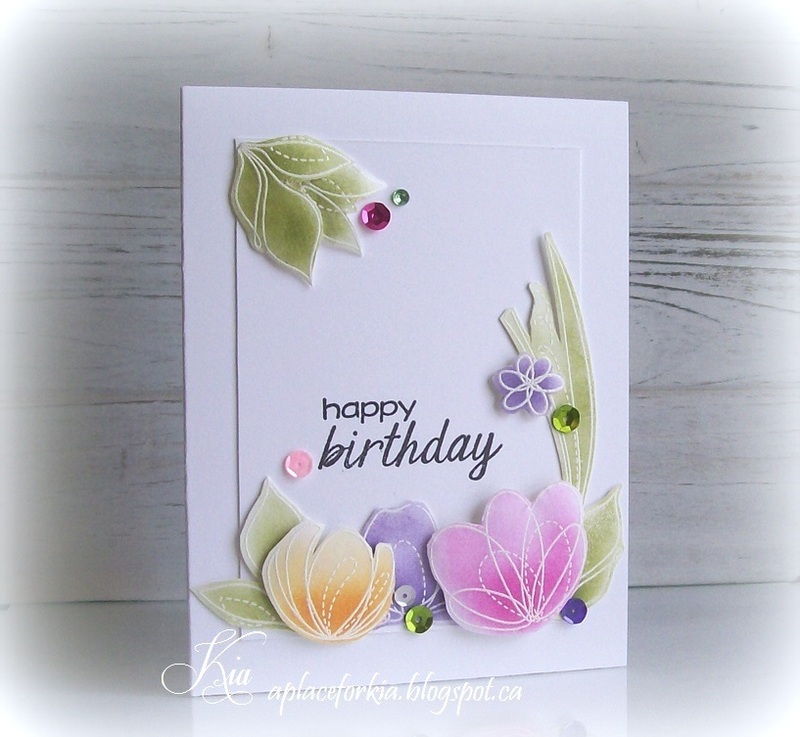 It is a Clean and Simple card with just a few stamps and some glam. I coloured using Spectrum Noir Markers and fussy cut the flower which is on a foam dot. Thanks for looking today. The CAS challenge at Splitcoaststampers on Monday was to use "Spring Critters" on your card. As it is getting close to Easter, I thought bunnies and/or chicks and remembered I had these cute digital chickies I could do. I coloured using Spectrum Noir Markers, added yellow matting along with my Lawn Fawn Stitched Borders. I think the chickies and the colours was enough - what???? no sequins or gems!! I couldn't let them be without a touch of glam, so added some Wink of Stella to the bows, although it is almost impossible to see in the picture. 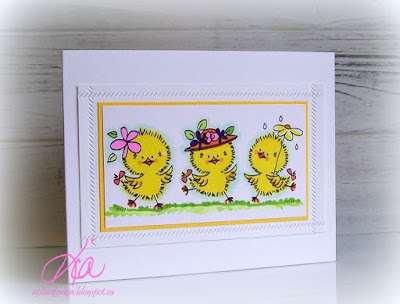 For this chickie, which I am calling Sunday Best, I used a floral watercolour designer paper in the background. And, again I coloured using Spectrum Noir Markers and framed her with the frame on foam strips. I used a coordinating paper on the inside where I put a Easter sentiment. The bit of glam on her is some Wink of Stella on the flower in her hat. Thanks for looking .... have a great day! Products: Pink Petticoat Fluffy Chicks and Designer Paper, Lawn Fawn Stitched Border Dies, Impression Obsession Frame, Spectrum Noir Markers, Wink of Stella. 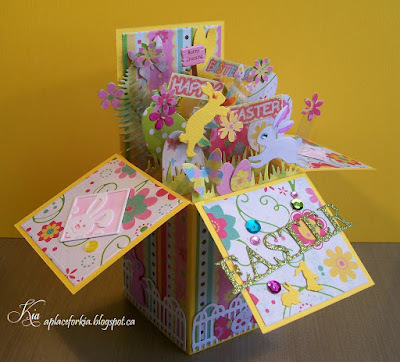 Cards I did for the Frantic Stamper March 15th release. They are all so very pretty with wonderful details. 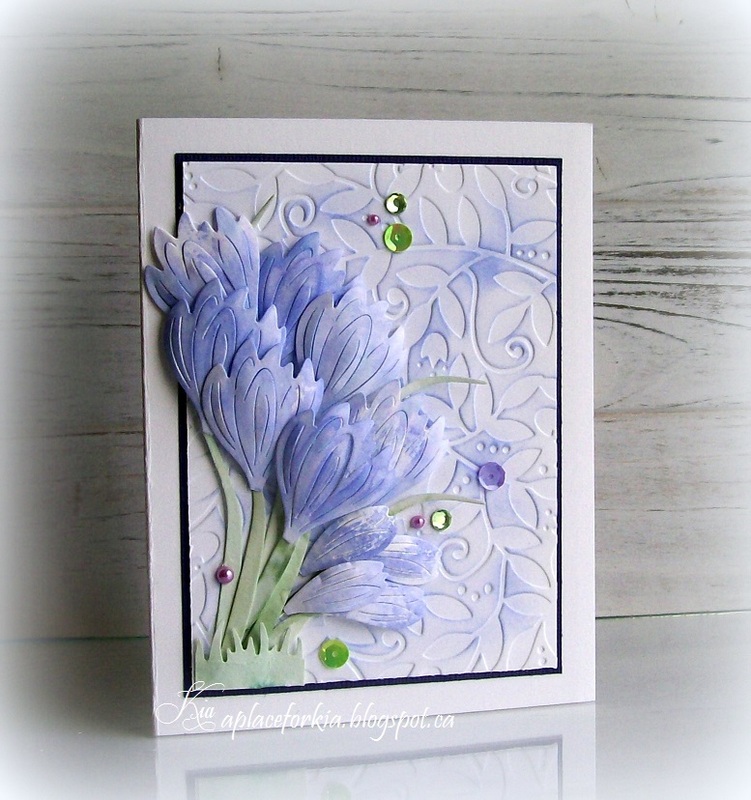 This card uses the Crocus from the ever lovely Mix'n Match Series of flowers. I love the way the Crocus styles up to show off its beauty. 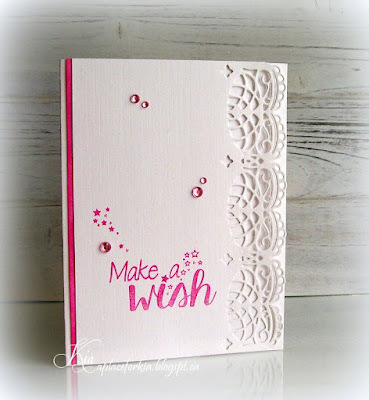 For this card I stamped my mat with Tim Holtz Distress Inks and spritzed with water then dragged the cut dies through the colour. I love the look. 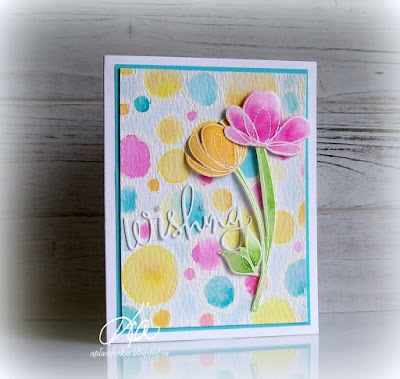 The background embossing folder I used on the reverse side to get this look and sponged on some of the Tim Holtz Ink I used on the flowers. The embossing folder is Taylored Expressions Leafy Vine. And, not to be left out, from the same Mix'n Match Series, this is the Daffodils set. 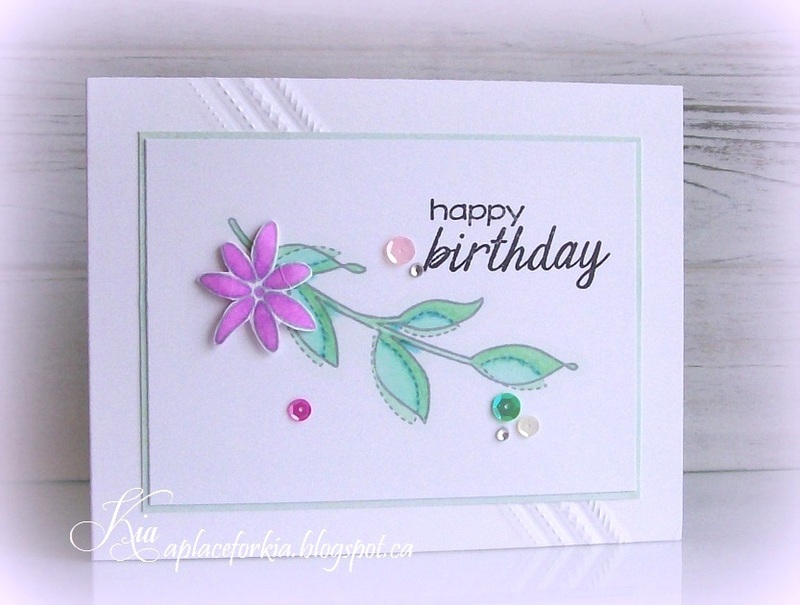 So elegant I decided on a fussy setting for my card. 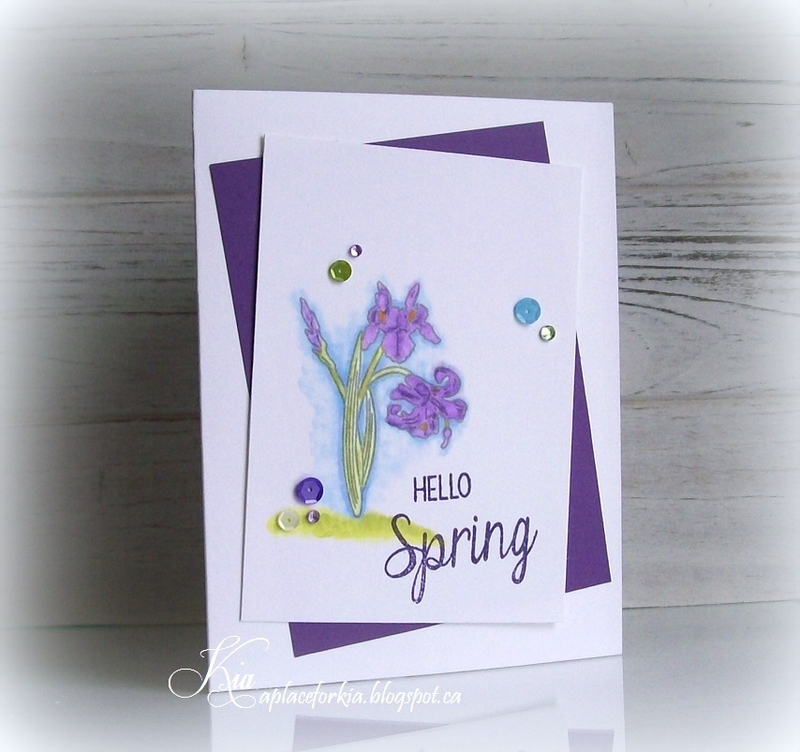 I also used the Frantic Stamper Elementals #12 - Ovals and the new Spring sentiment die. 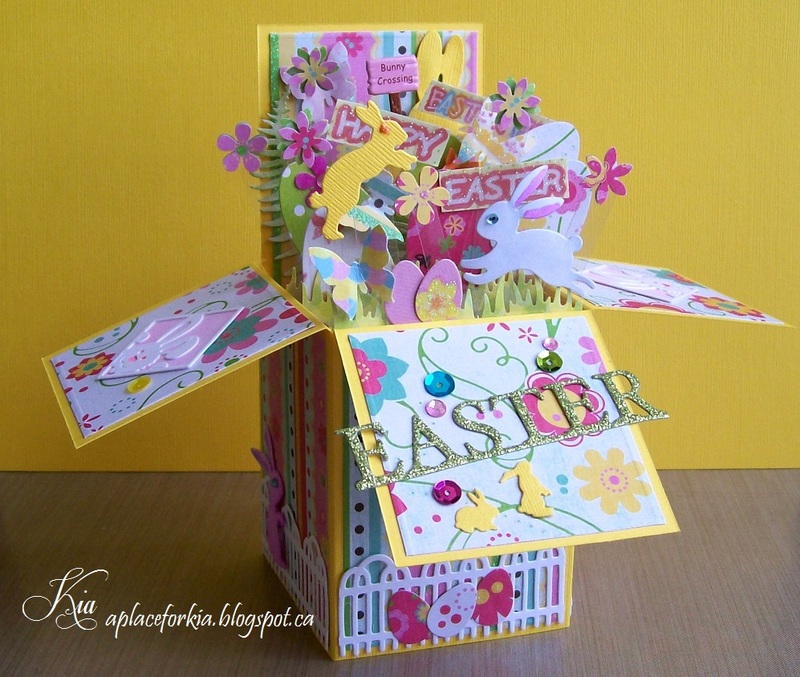 On this card I coloured the dies with Spectrum Noir Markers. I added some Wink of Stella to the Daffodil centre, which is hard to capture in a photo. 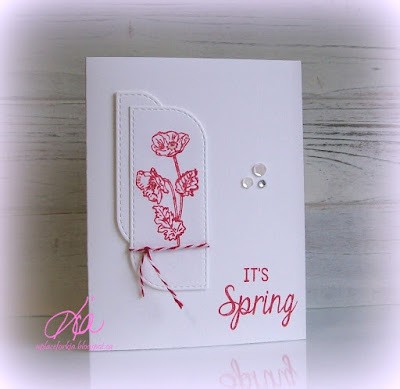 For this card I used the new Spring is Blooming Clear Stamp Set, which includes some wonderful sentiments and 4 different flower images. 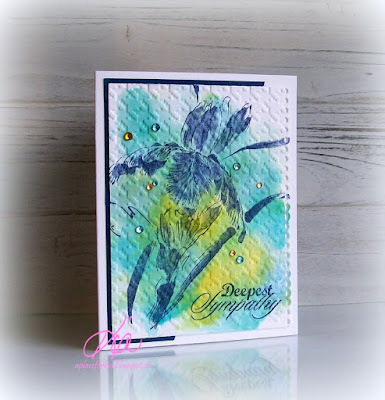 And, again on this colour I coloured with the Spectrum Noir Markers and used Tim Holtz Distress Inks for my sentiment. There is much more in this release and you can view a video showing off the new release with cards done by the Design Team for Frantic Stamper here at In My Spring Garden. 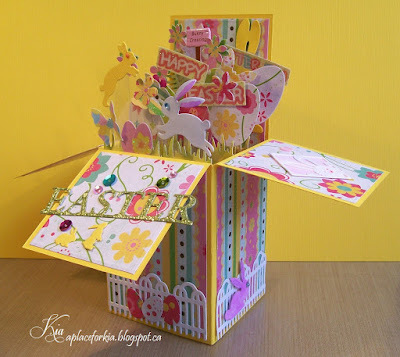 For the Inspiration Challenge at Splitcoaststampers today we had a visit to a Pinterest Board called Easter Egg Hunt. So fun looking at all the different eggs. I picked these eggs as my starting point. 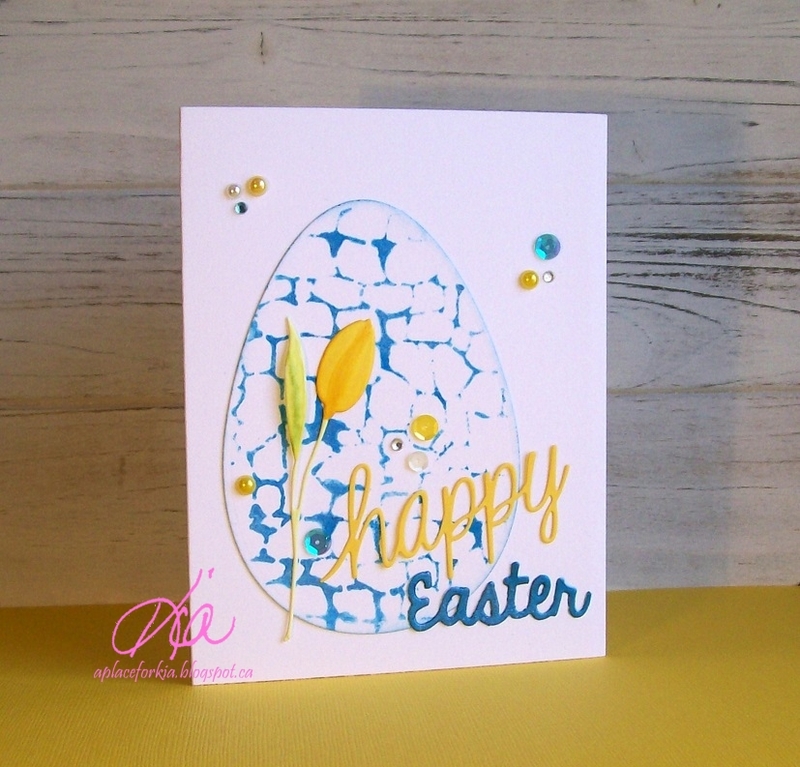 I die cut my egg and stenciled with my stone stencil using Viva Decor Inka Gold Steelblue Ink. I added the yellow tulip coloured with markers as is the happy sentiment. The Easter sentiment is coloured with the Viva Decor. A few sequins, crystals and pearls to finish. A fun and easy card today ... thanks for having a look. 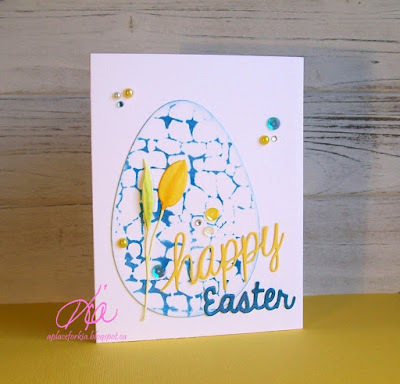 Products: Spellbinders Nested Eggs, Prima Stencil, Joy Crafts Spring Flowers, Frantic Stamper Happy Sentiment, Taylored Expressions Easter Sentiment, Spectrum Noir Markers, Viva Decor Inka Gold Steelblue Ink, Sequins, Pearls, Crystals. I played along with the Bingo Game Colour Challenge at Splitcoaststampers today. A board of 16 different colours to pick from. 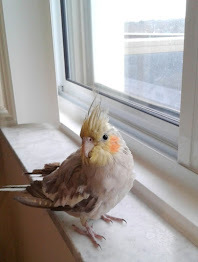 My colours are the light and darker pinks, the yellow and a suede. And as it is a gorgeous day in my area, I was thinking of spring and flowers and then bees. So, that is where I went with my card. I embossed the background with white embossing powder and used my aqua brush to apply the colours. As it is cardstock (120 lb) I am working on and not watercolour paper, I kept the water to a minimum. I die cut the sentiment in white and coloured the word and circle portion with a Spectrum Noir marker, then glued back in the white space. The bee is watercoloured and fussy cut, and is on a gel dot so he wiggles! And, for my dessert I used my signature sequins, crystals and pearls. 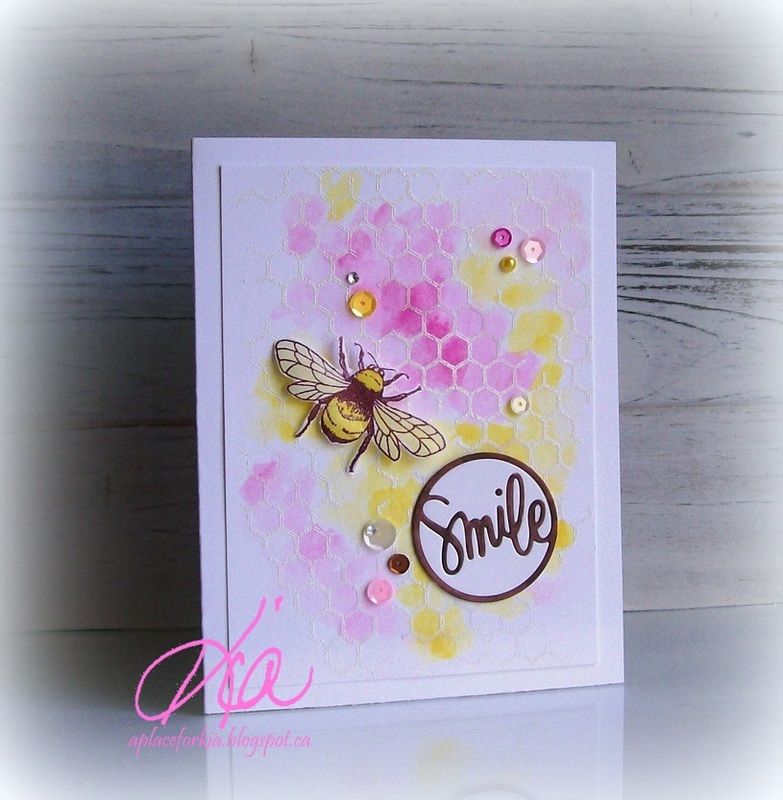 Thanks for looking and I hope you enjoy Honey Bee Smile. Products: IndigoBlu Honeycomb Background, Deep Red Honey Bee Label, Simon Says Stamp Sentiment Smile, Sequins, Crystals, White and Clear Embossing Powder, Aqua Brush, Tim Holtz Distress Inks Picked Raspberry, Spun Sugar, Mustard Seed, Brilliance Crimson Copper Pigment Ink, Embossing Ink. Another view of the front side of the box. and this shows how the box collapses flat for mailing. 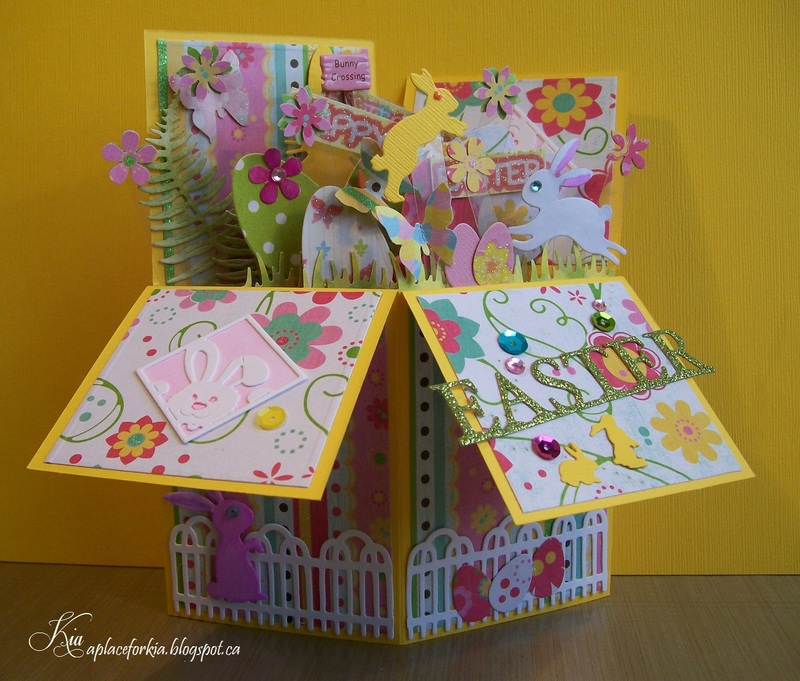 Products: Frantic Stamper Easter Sentiment, Frantic Stamper Peeking Bunny Squares, Frantic Stamper Bunny Confetti, Frantic Stamper Bunny Back, Frantic Stamper Fern, Impression Obsession Bunny Set, Impression Obsession Rabbit Set, Impression Obsession Fence, Spellbinders Nested Eggs, Martha Stewart flower Punches, Martha Stewart Grass Border Punch, Martha Stewart Butterfly Punch, Memory Box Butterfly Delights Die, Bunny Crossing Brad, Sequins, Crystals, Stickles, Imaginisce Designer Paper, Bazzill Cardstock, American Crafts Glitter Paper, Spectrum Noir Markers, Tim Holtz Distress Inks. 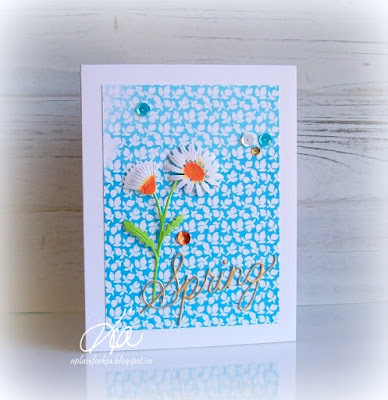 Products: Simon Says Stamp Spring Flowers, Frantic Stamper Square Stitched Petals, Hot Off The Press Heartfelt Greetings, Spectrum Noir Markers, Sequins, Crystals. 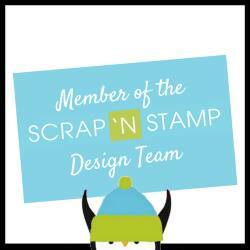 The Inspiration Challenge at Splitcoaststampers today had us visiting the world of miniatures. Fascinating and amazing work all done in miniatures. I picked this dragonfly for my inspiration and as I do not have a dragonfly I did a butterfly. It is snowing in my neck of the woods today, so I added a lot of layers to my butterfly as I wanted colour in my grey world. 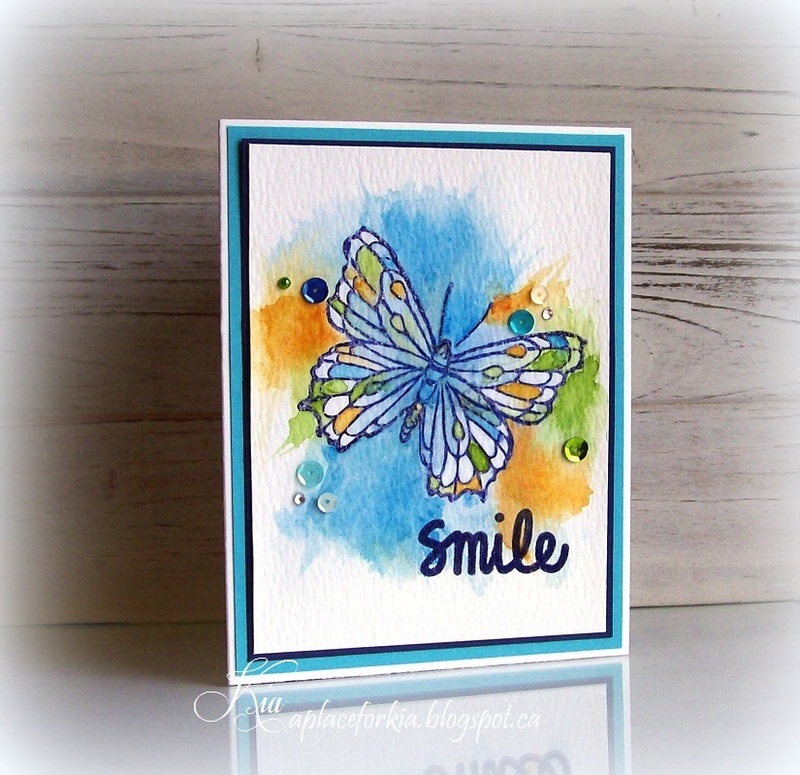 I stamped the butterfly with navy ink and heat embossed with clear embossing powder. I then sprayed my paper and dropped water moving the piece around to allow the paint to run - then drying and adding more colour until I was happy. I stamped the sentiment and finished with sequins and crystals - candy for the butterfly! Products: Stampendous PenPattern Butterflies, Technique Tuesday Sentiment, Winsor Newton Watercolours, TH Distress Inks Navy, Clear Embossing Ink and Powder, Sequins and Crystals. My final card for the March 1st Frantic Stamper Release covering Geometrics and Elementals. 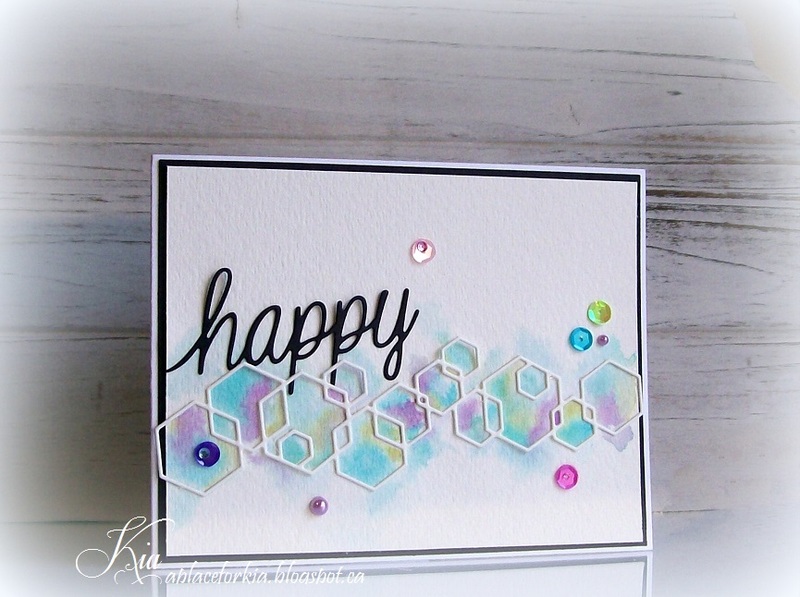 I love this gorgeous Double Diamond Card Panel and can see many uses for it. 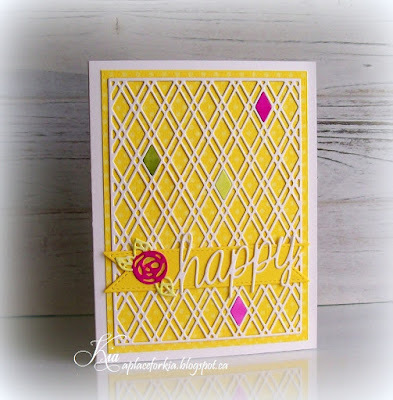 For this card I used a bright yellow cardstock for the background of my Diamond Card Panel, then filled a few of the diamond negatives with some coloured diamonds. 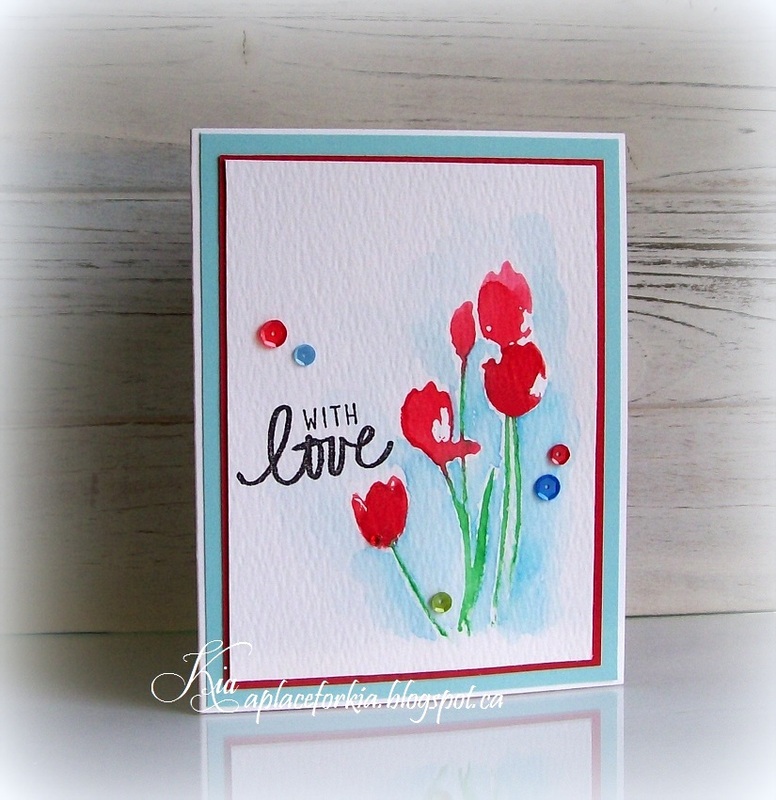 I used the Fishtail Labels tag and added the happy sentiment along with the small Scribble Rose which I also coloured. A very happy card indeed. 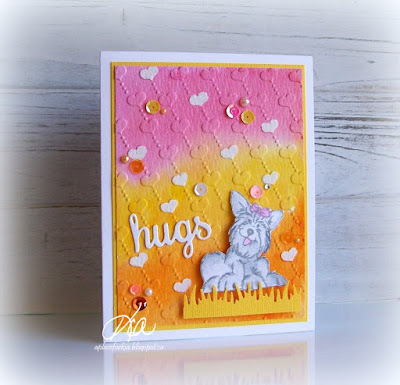 Products: Frantic Stamper Double Diamond Card Panel, Fishtail Labels, Scribble Roses, Happy Sentiment Die, Spectrum Noir Markers, Bo-Bunny Cardstock. 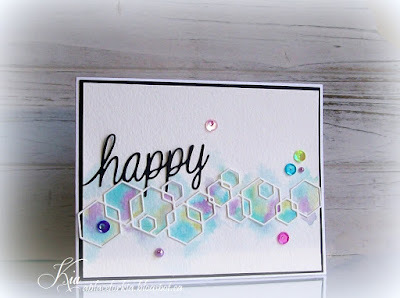 Products: Frantic Stamper Linked Hexagon Border Die, Frantic Stamper Happy Die Sentiment, Tim Holtz Distress Inks, Sequins, Kaiser Pearls. 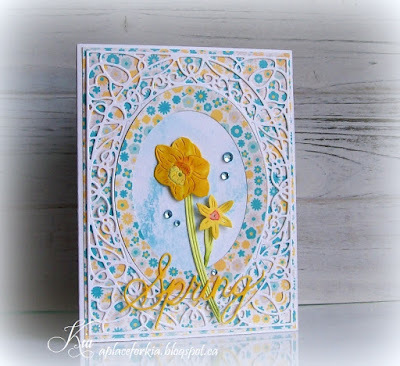 Products: Penny Black Brush Tulips, Art C sentiment, doCrafts Markers, Tim Holtz Distress Inks, Sequins, Crystals.